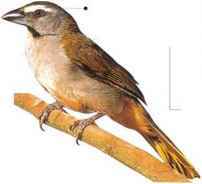 A tree dweller with a massive bill and a melodious song, this bird lives in open secondary woodland and shrubbery (regrown after forest clearance), eating insects, fruits, seeds, buds, and blossoms. • NliST A loose cup nest of twigs and grass, with a finer lining, in a tree. North America east of the Rockies. Winters in Central and South America. Well known for its vivid colors and loud, musical calls, the Northern Cardinal is a woodland species that has adapted to living in suburban gardens. 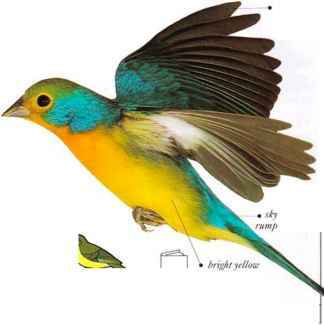 Throughout its range, it lives in undergrowth, where it searches out its diet of insects, fruit, and seeds. Both sexes sing for much of the year. • NliST A coarse cup nest of leaves and twigs, lined with grapevine bark, placed just above the ground in a bush. A large, heavy-billed, tree-dwelling bird, this is a wary species with inconspicuous plumage. It often keeps out of sight in dense cover afforded by the foliage of scrub and forest-edge undergrowth. 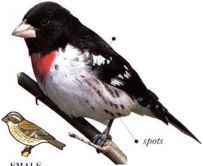 It is common in its range and is usually encountered singly or in pairs. The diet consists of fruits and insects. • NliST A cup-shaped nest constructed of coarse grasses, twigs, and other plant material, and situated in a bush or small free. • DIS TRIBUTION Central America, N. and li. South America. I his colorful hut shy hunting is more often heard than seen. It lives in semi-arid countryside on hillsides covered with scrub and bushes. The diet consists of seeds and insects. These are taken from low branches or the foliage of bushes, from the ground underneath vegetation, or from open ground. I lowever, foraging birds rarely move any distance away from the safety of cover. The male sings with a varied series of clear, warbled phrases from the top of a bush. • NKST Unknown. Closely related species are known to make a neat cup nest of grass, lined with finer grasses and animal hairs, and placed in a bush or a low tree.